It would not be until 1883 when a railway on Rügen soil was built. It originally stretched as far as Bergen auf Rügen to begin with, and was extended 8 years later to reach the northern coast of the island at Sassnitz. At this point however, there was no fixed crossing with the mainland, instead, the body of water known as the Strelasund was traversed by ferry. Traffic steadily grew in popularity as Germany and Sweden were ever closer linked. Mail would cross borders via Rügen faster than ever before, and eventually, a railway ferry was established between the two countries to bring them even closer together. The success of the ferry urged a greater connection to the mainland, and so in the 1930s a bridge was built over the Strelasund. It wasn’t just Sassnitz and Sweden that benefitted from the island railway, the coastal town of Binz also found itself served by a single track branch line from Lietzow, and today serves as an equally important destination with every other train terminating there. Following electrification, and the fall of the iron curtain, Rügen has become something of a holiday resort and has been referred to as “Brighton for Berliners” by those who have reviewed its Baltic coastline; and what better way to go on a summer holiday than by scenic rail! 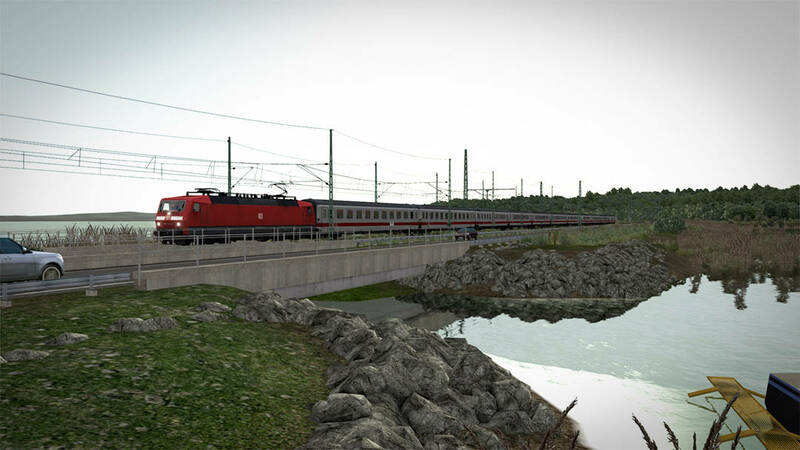 Inselbahn: Stralsund – Sassnitz will be coming soon to Train Simulator and will bring both passenger and freight flavours of island rail operations of Rügen to life – watch this space.